Music Mania TV's artist showcase and talkshow will feature The ZYG 808 in front of a live studio audience. CAMBRIDGE, Mass. 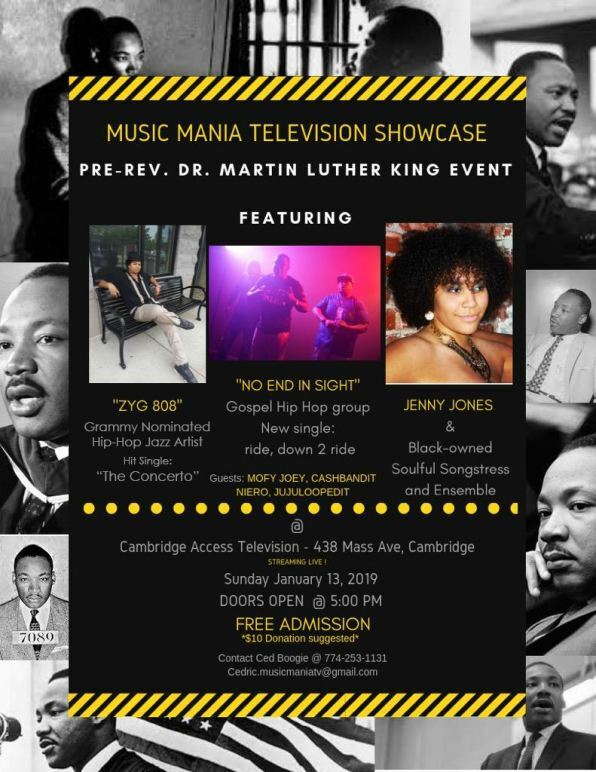 - Jan. 9, 2019 - PRLog -- Grammy nominee, The ZYG 808 will be one of three acts and artists featured in the Music Mania TV Showcase, which will be filmed live at Cambridge Community Television on Sunday, January 13th - 438 Massachusetts Ave, Cambridge. Doors will open at 5pm for a 5:30 start time. Also set to perform are Gospel hip-hop act, "No End In Sight" and soul singer Jenny Jones. The ZYG 808, who received 2 Grammy nominations in Hip-Hop for his debut E.P. "At The Party", has been developing quite the resume as a performer and speaker on various social and cultural topics around New England, while remaining as an honor roll student and writing and co-producing material for his upcoming album, "The Intro". In an era where many young artists are using the Internet to take the place of the stage, The ZYG 808 focuses on building a connection with his audience, face-to-face. The ZYG 808 will also be performing with The GroovaLottos at Beatnik's in Worcester on January 25th; as well as the TOUCH-TV talkshow with Charles Clemons Muhammad on January 30th.